Ben Johnson (born 1946) is a British painter who trained at the Royal College of Art, London. He has internationally exhibited his works, in which architectural representation (both contemporary and historic) provides a consistent theme. 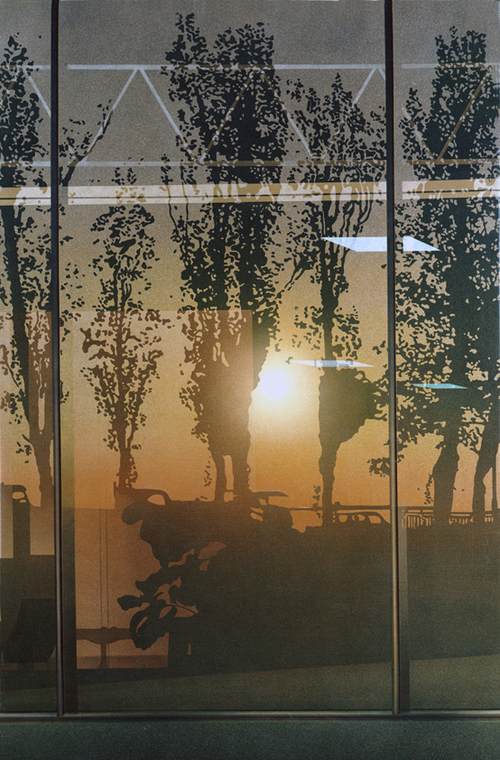 Renowned for their hyper-realistic qualities, his paintings and screen prints have long taken Norman Foster's buildings for their subject. The 1991 Venice Architecture Biennale marked a highpoint of collaboration between artist and architect, with Foster's buildings illustrated solely by Johnson's images. 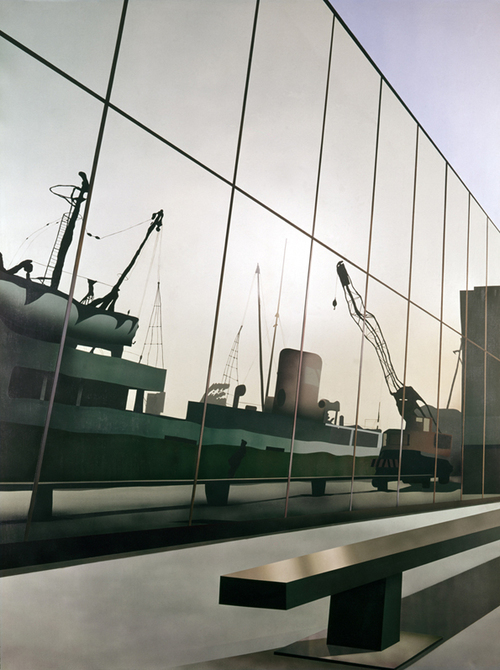 In an early painting, this acrylic on canvas entitled 'Dock Reflection' of 1971, Johnson gives oblique view of the Fred Olsen Amenity Centre in London’s Docklands. Completed in 1970, the use of a full-height glass curtain wall for industrial buildings was almost unprecedented. Drawing upon technological advances pioneered in America, the panes were sealed with neoprene gaskets and supported internally by an aluminium frame. The geometric regularity of the hairline fixings establishes a rhythm of perspectival recession. This contrasts with the precisely recorded reflections of the quayside, where straight lines become undulated and distorted. As this building was demolished in 1988, such a permanent record of its visual appearance is all the more poignant. Johnson´s painting of IBM’s Pilot Head Office at Cosham records another structure which is now lost. His image was based upon a photograph by Richard Einzig, a leading photographer of Foster´s work. Commissioned by Foster himself in 1974, its title Neoprene Gasket Supporting Curtain Wall Reflection celebrates the technical advances neoprene made available. With minimal fixings between each pane of glass, the curtain wall seems weightless, dissolving the boundary between interior and exterior space. The bronze amber tint of the solar-reflective glass deepens and enhances the hues of the reflected landscape. For the Renault Distribution Centre, Johnson scouted the building and recorded his responses to its structural incidents with the camera. He used these photographs as the basis for screenprints, and this acrylic on canvas. The visual emphasis is one of the articulation of structural components. Prominence is given to the ‘umbrella’; the module unit Foster devised to enable the building to be flexibly adaptable for future expansion, which drew inspiration from agricultural structures. The vibrant palette of primary colours makes a sharp contrast between structure and setting. Perforated beams mark out bold diagonal axes across the composition, with the cables further delineating volume. Standing at the building's perimeter, the ’umbrella’ is foregrounded against the grey wall panels. Johnson´s 2006 Tokyo Pool records the interior of one of the amenity spaces within the Century Tower, Tokyo. Constructed as speculative offices, the building’s aim was to unify the aesthetics of east and west; a goal realised in part through the prominent use of water. Here, the catenary curve of the glazed roof is mirrored on the pool’s unbroken surface. 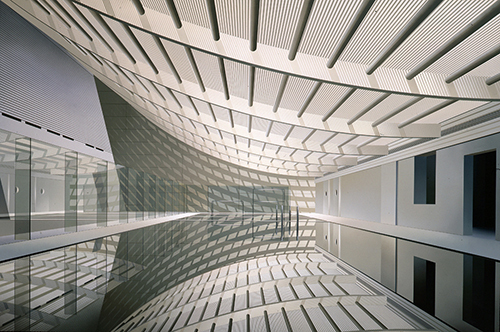 The light is filtered through perforated louvers echoing those of the Sainsbury Centre for the Visual Arts and, combined with the single-point perspective, draws the eye into the illusionistic depth of the space. The contrast between the roof and its shadow amplifies the volume, while the whole interior presents an impression of serene tranquillity. For more artworks, please visit Ben Johnson website. In an early painting, this acrylic on canvas entitled Dock Reflection of 1971, Johnson gives oblique view of the Fred Olsen Amenity Centre in London’s Docklands. Completed in 1970, the use of a full-height glass curtain wall for industrial buildings was almost unprecedented. Drawing upon technological advances pioneered in America, the panes were sealed with neoprene gaskets and supported internally by an aluminium frame. The geometric regularity of the hairline fixings establishes a rhythm of perspectival recession. This contrasts with the precisely recorded reflections of the quayside, where straight lines become undulated and distorted. As this building was demolished in 1988, such a permanent record of its visual appearance is all the more poignant.